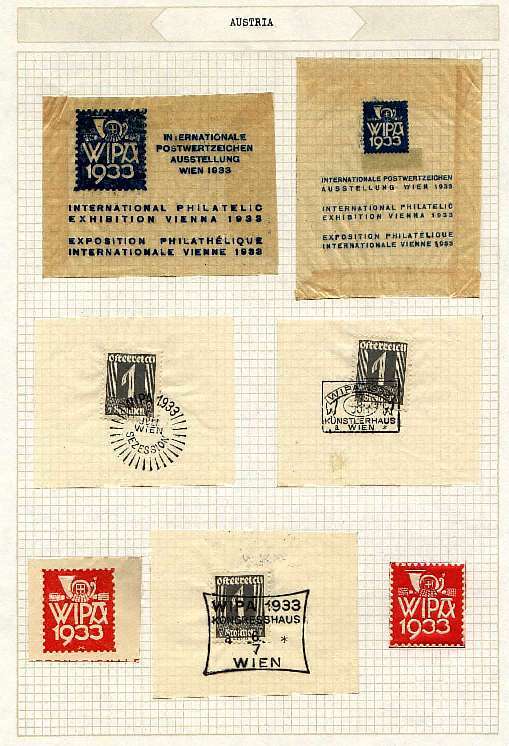 According to a history of the event published for WIPA 2000, there have been five WIPA's - 1881, 1933, 1965, 1981, 2000. 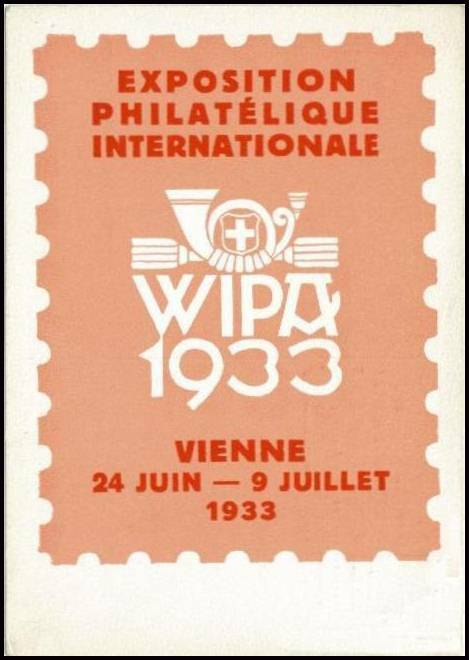 WIPA 2008 was the most recent. 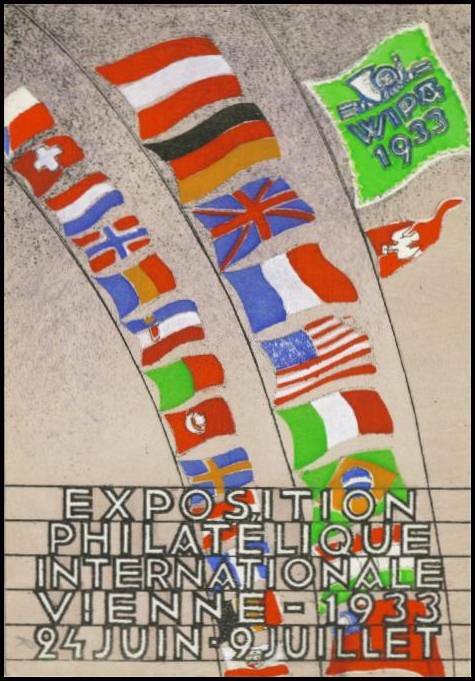 Other international philatelic shows were held also in Vienna in 1890, 1911, 1923, 1968 and 1975, with various names. 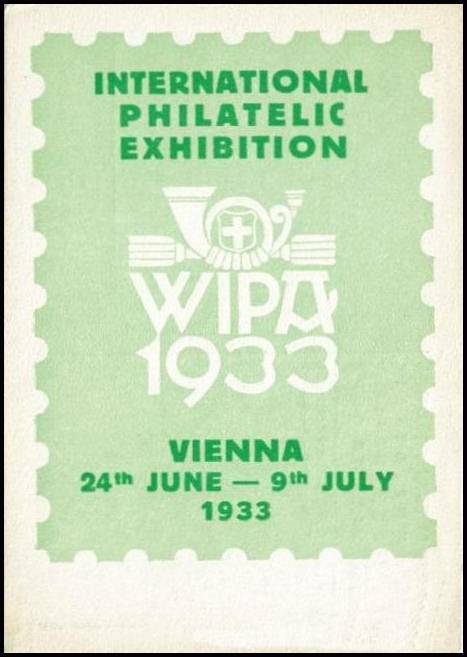 All have been landmark philatelic exhibitions, not just in Austria, but in the philatelic world as a whole. 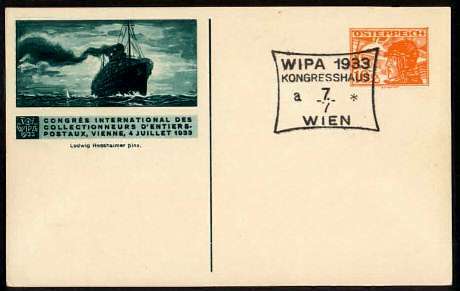 For the Cinderella collector, WIPA 1933 is the most famous of these events, a show that generated an unequalled quantity and quality of Cinderella material, creating fascinating and rewarding opportunities for collectors ever since. 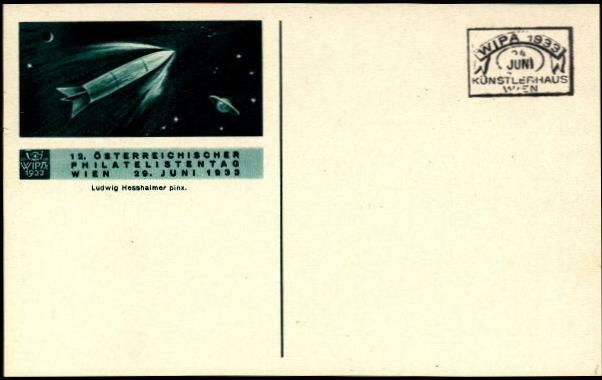 Official description - "Vom Postläufer zur Postrakete" or "From the post office runner to the post office rocket"
mentioned in the third Prospectus. who was an exhibitor at the show. 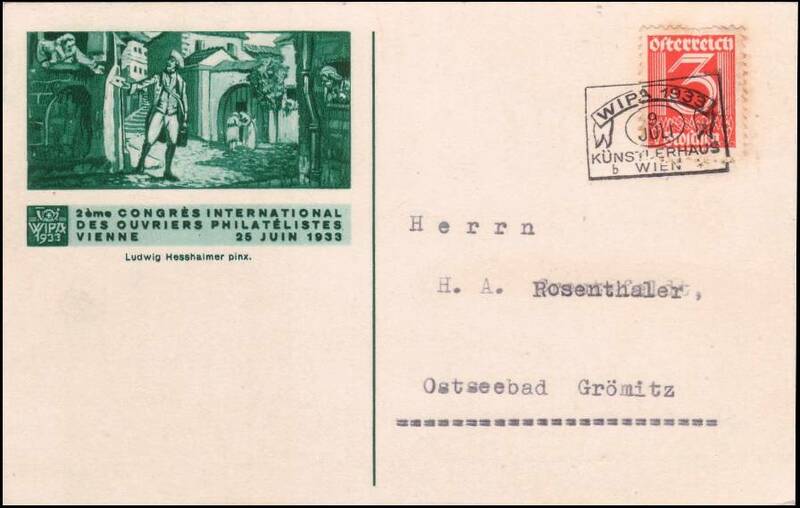 The History of Mail Transport seals were issued in advance of the show, as publicity. 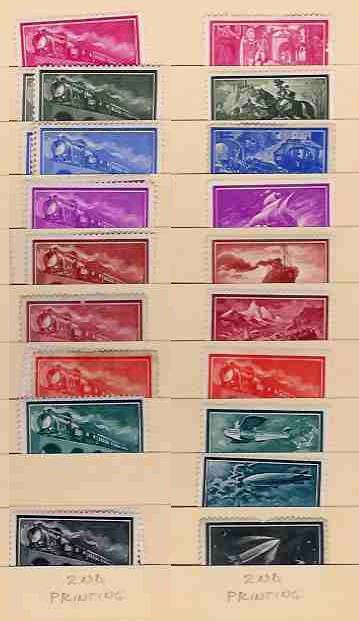 They were so popular that their initial printing was exhausted quickly, and they had to be reprinted. 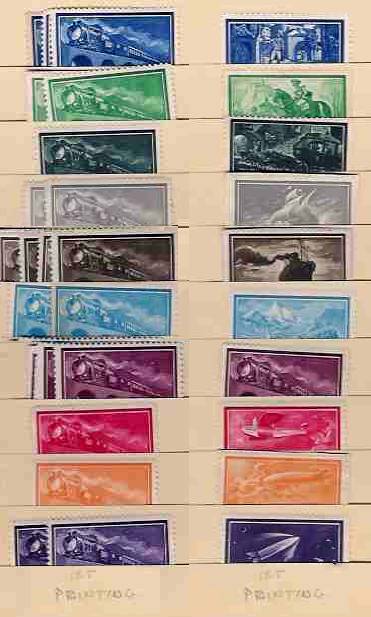 Probably because it was felt that collectors would enjoy having even more colors, the reprints were done with different colors from the originals. 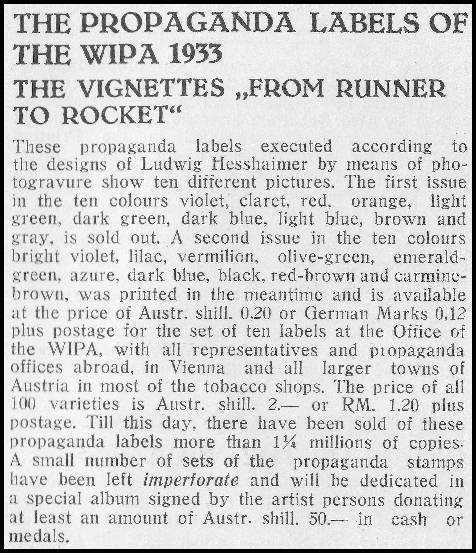 (This is not mere theory - this excerpt from the 3rd Prospectus of December, 1932 confirms it - and names the colors, for whatever that's worth - as does the folder for WIPA 2000.) As far as I can tell, the two printings are equally plentiful. 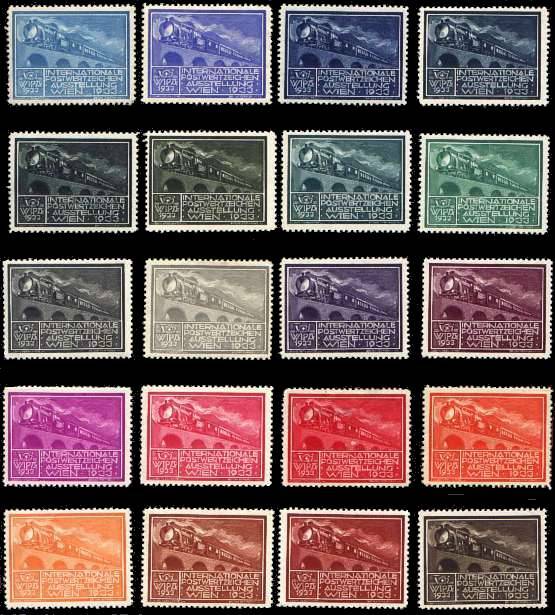 The colors are quite distinct, once you have examples, but I don't think you could match a stamp to my scans, as the characteristics of my scanner combined with the idiosyncracies of your monitor or printer introduce too much distortion. 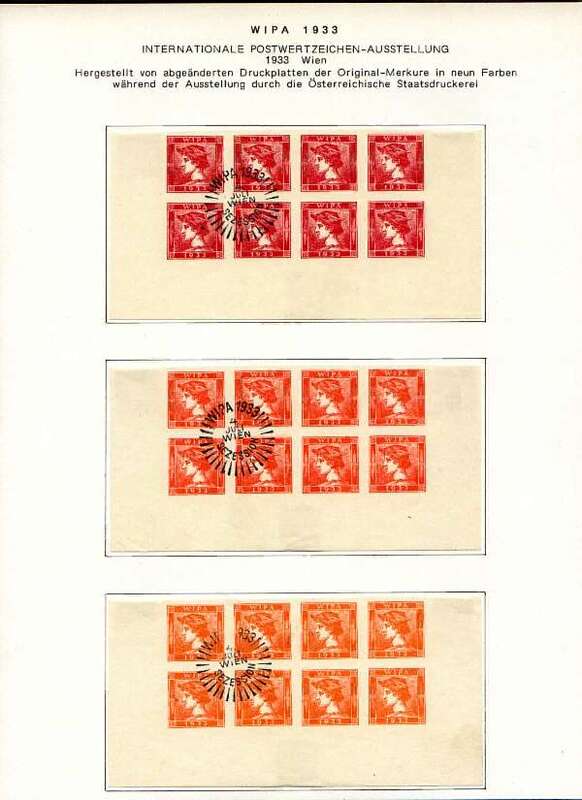 Below is an image from an eBay auction, showing a set of ten of the transport stamps with a 1933 WIPA glassine envelope, implying that this is how the sets were distributed to attendees. 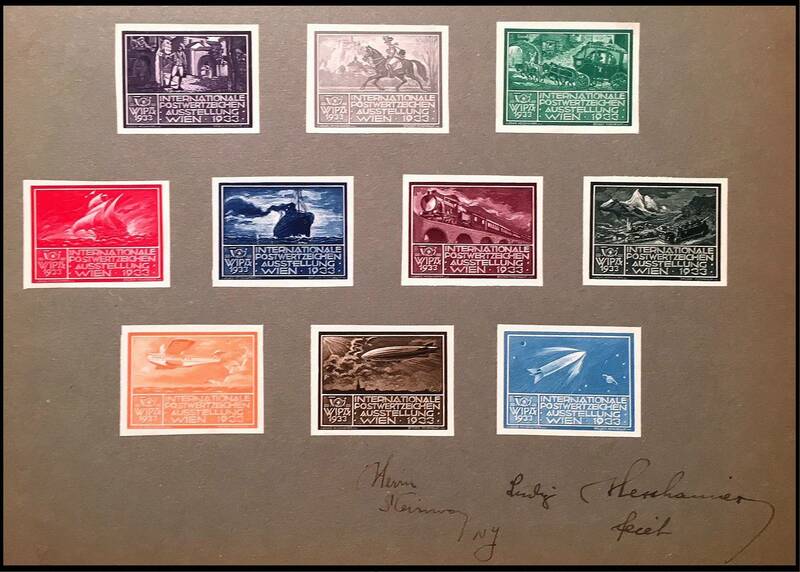 Note that the colors of this set are the same as the colors in the scan labelled "Colors of 2nd Printing" above - the first printing had run out by the time of the Exhibition, so all the Transport Stamps distributed at the show were from the second printing. This helps confirm that the assignment shown of colors to 1st and 2nd printings are correct. 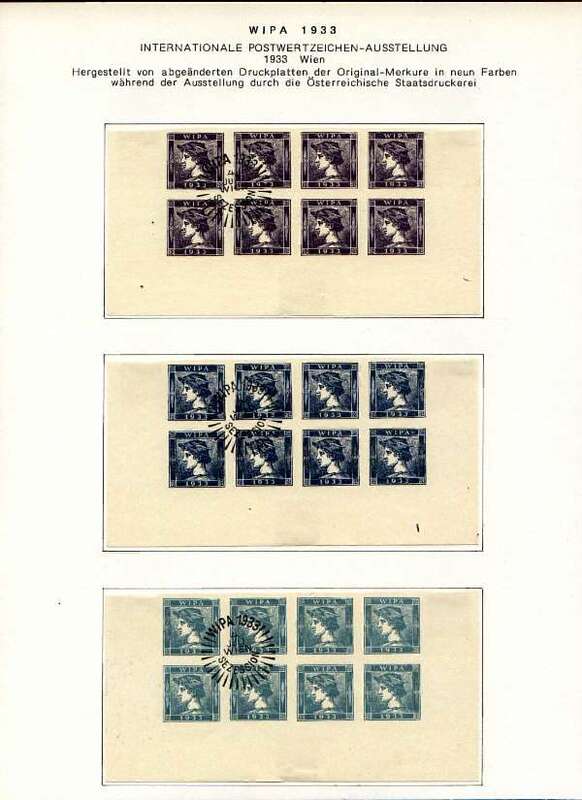 Note also that the stamps in the scan near the top of the page - "Proofs" in original colors - match the colors of the scan labelled "Colors of 1st Printing" - and this too makes sense, as the proofs were done for the first printing. 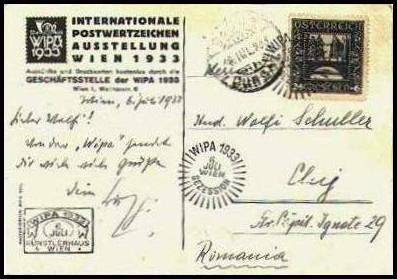 6/29/08 - I recently acquired a cover with one of the WIPA HoMT labels tied by January, 1932 postmarks! That seemed too early, but I bought it anyway. See images of the cover below, and CLICK HERE for a full page of discussion and debate about it. 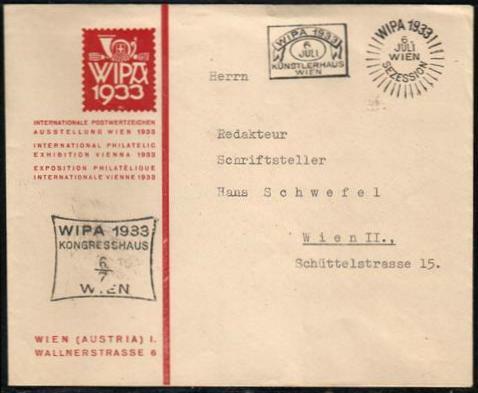 2/08/10 - WIPA collector Steve Schweighofer sent me these images of a cover with a WIPA '33 HoMT label, and postmarked November 14, 1931. The label is not tied, but there is no reason to suspect it was added later. And Steve writes "According to literature I have, the first labels were available as early as October 1931." , which helps confirm that this usage is completely authentic. 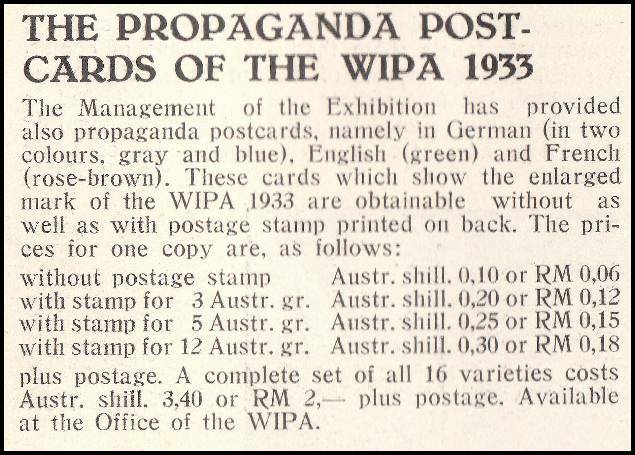 The WIPA postal stationery was apparently PTPO (Printed to Private Order), a fairly common practice at the time - businesses and events had their designs added to official postal stationery. 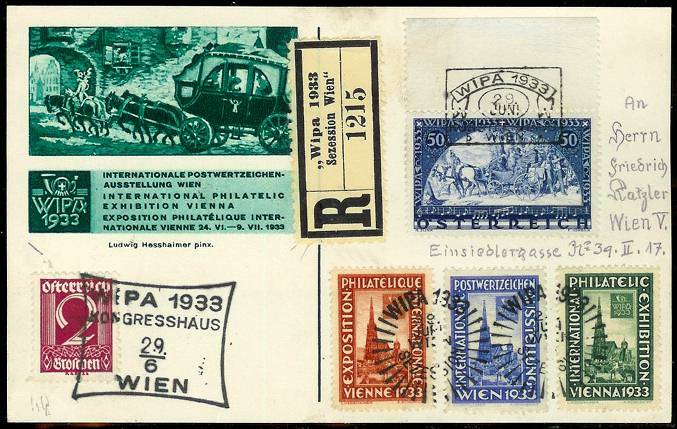 As is common with international philatelic shows, each day was connected with a specific theme or event, nine of which were commemorated with these cards. The tenth (the train) is actually dated the day before the show started. 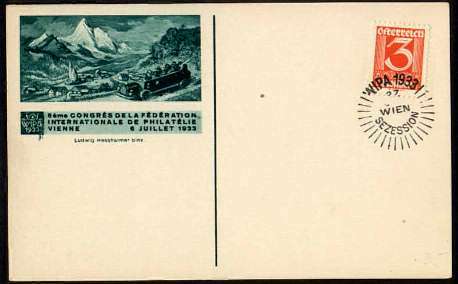 I have seen multiple examples of all ten of the History of Mail Transport designs on these cards, and the inscription with each design is always the same, so I do not think other combinations of language/image/theme/date exist. 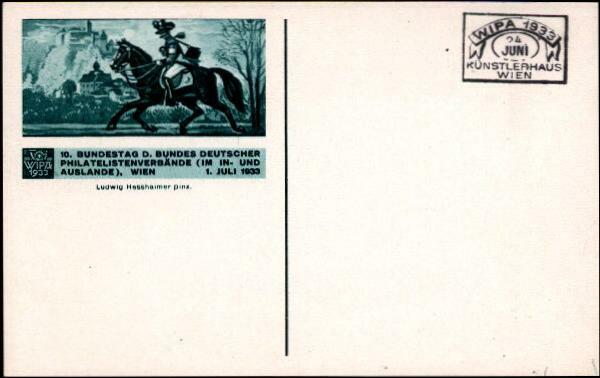 However, I have seen many different combinations of image and postal indicia on the postal cards, so there would seem to be many varieties of those. Envelopes are much scarcer than cards. I assume there were items of some other type issued for the other seven days of the show, but have not seen any, so I may be wrong. 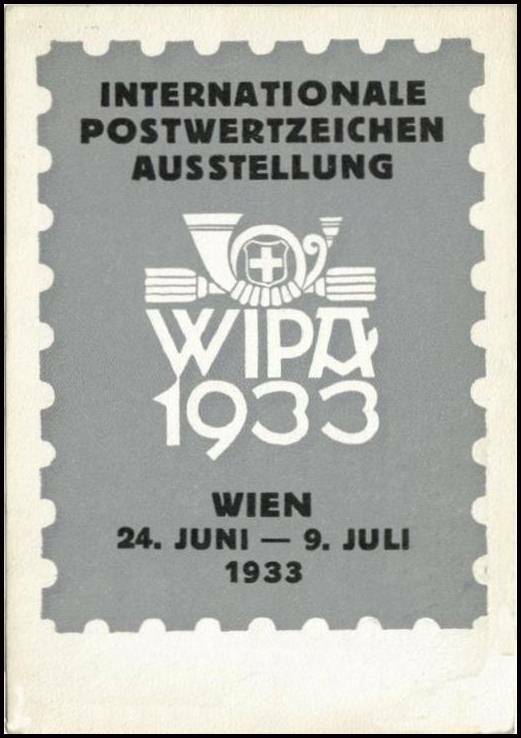 I have accumulated images of WIPA postal cards with TWENTY-THREE DIFFERENT combinations of preprinted postal indicia (nineteen of which are shown below). 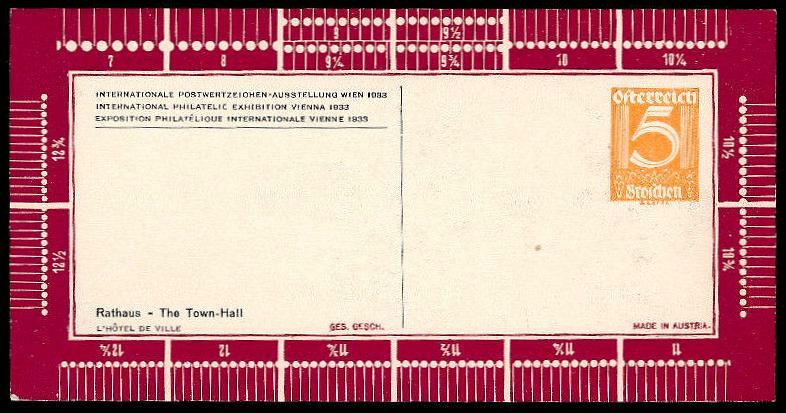 This is an astonishing number, and strange as it seems today, suggests to me that the indicia were printed on the cards, on demand, at the show. Further supporting this theory is the irregular placement of the indicia - some are even crooked. 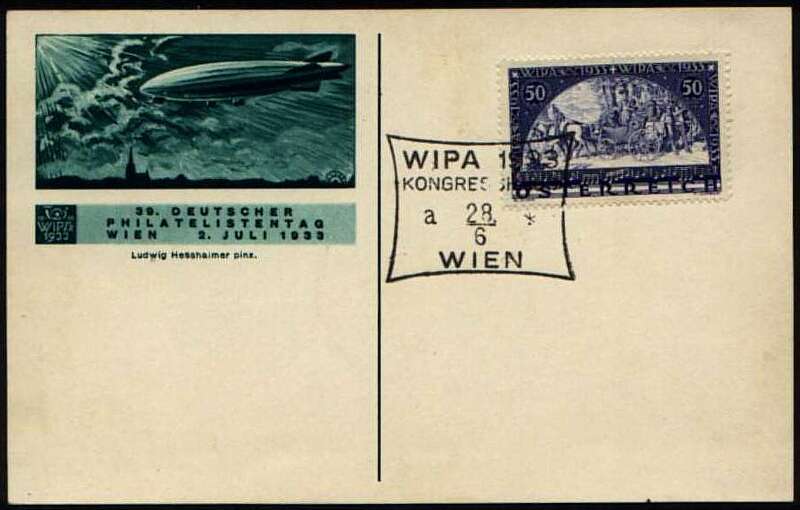 And the Austrian State Printing Works did have printing facilities at the show. 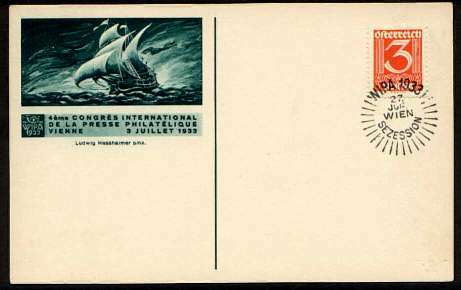 Nineteen different combinations of postal indicia! 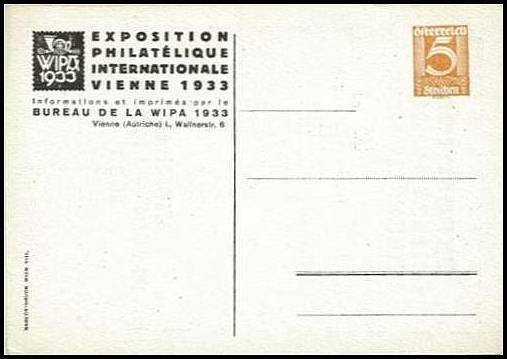 8/23/2008 - Herb Trenchard wrote to confirm my deduction about the preprinted postal indicia on the WIPA 33 stationery. 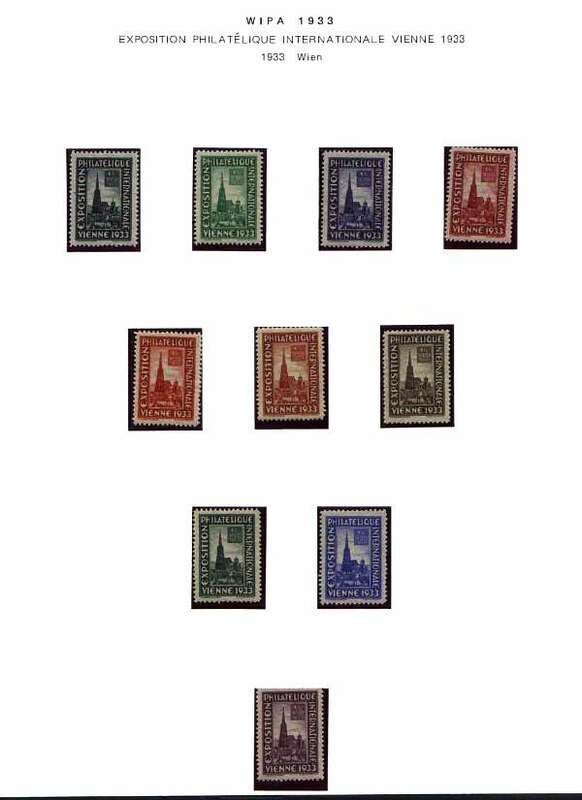 The PO arranged for 8 special stamps to be applied at the show. 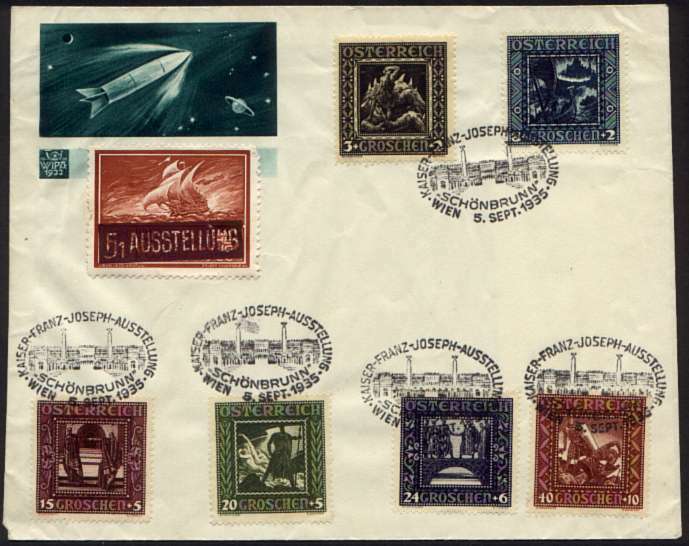 There were 4 regular (12, 24, 40, and 50 Gr) and 4 airmail denominations (10, 15, 30, 50). On a given day, only one could be applied. 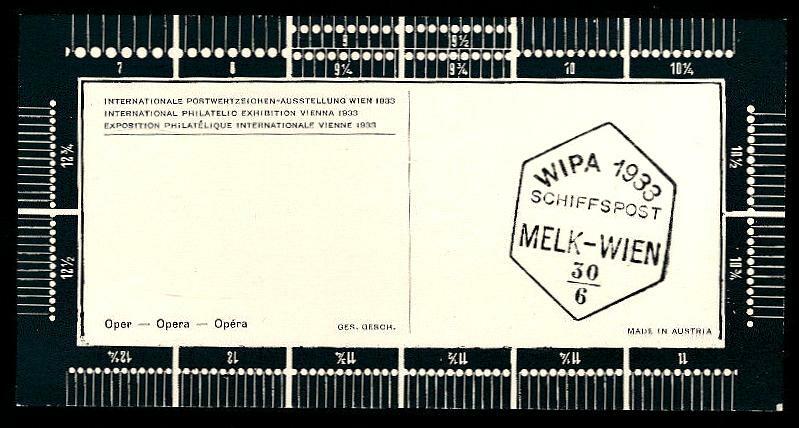 Each of the eight was applied on two days-over a period of 16 show days, but they could only be applied to the special cards and envelopes sold by WIPA - i.e., the ones with one of the 10 "Runner to Rocket" cachets, all printed in color green. 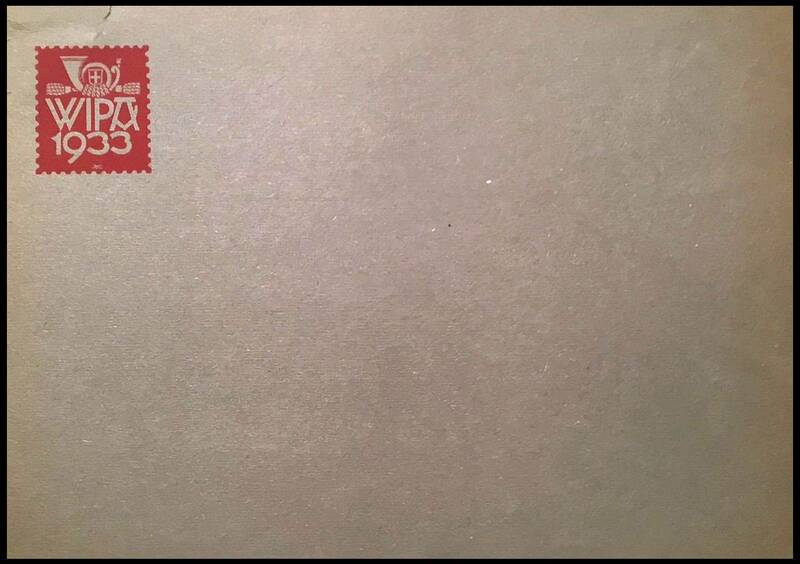 The PO then allowed up to 3 impressions of the stamp of the day to be applied. 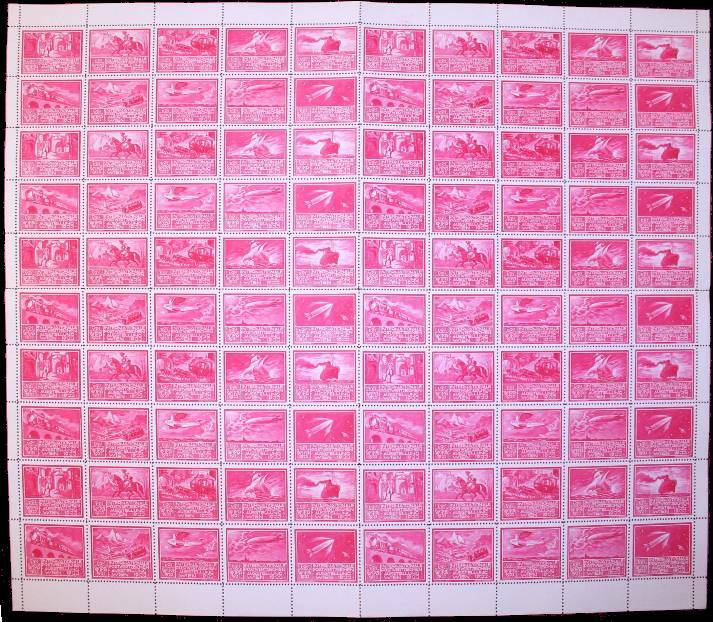 You could bring your already stamped card or cover back on another day and add 1 or 2 impressions of the stamp of that day. 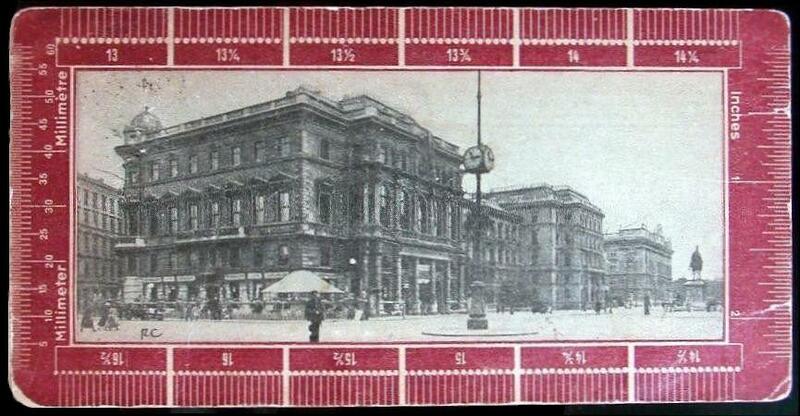 The PO would only add new impressions UP TO A TOTAL OF 3 per item! The WIPA and PO don't record how many items were serviced. But they record how many of each impression was applied. The grand total was 32,142. 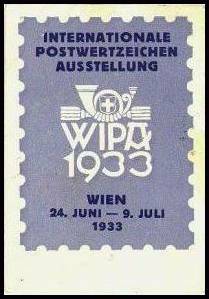 The PO arrangement at WIPA 33 was a first and never repeated again. 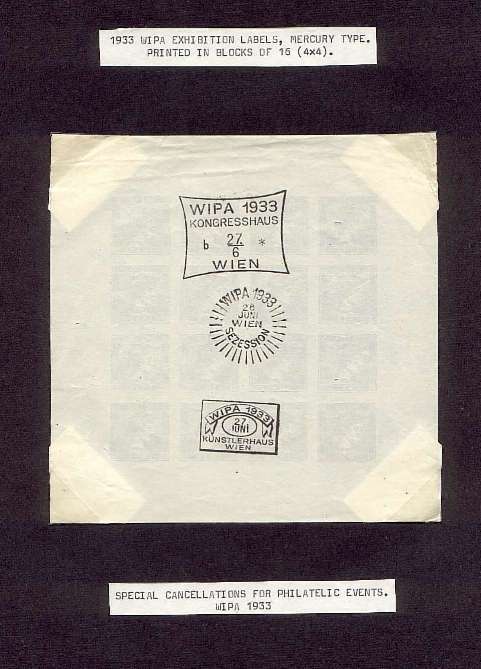 The WIPA 2000 folder I own says there were three special Registration labels created for WIPA 1933, a great honor at the time. 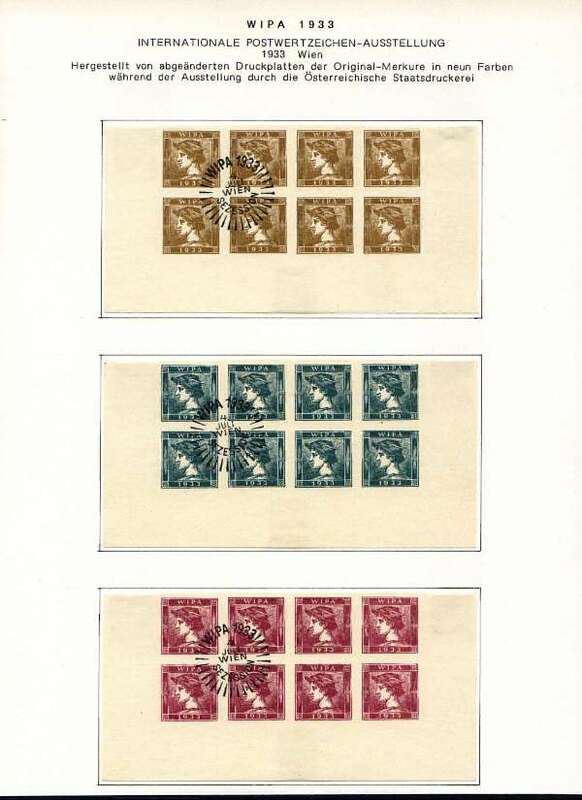 These etiquettes were a popular collecting specialty then, since they were carefully controlled by the postal authorities, and were printed specifically for each town. 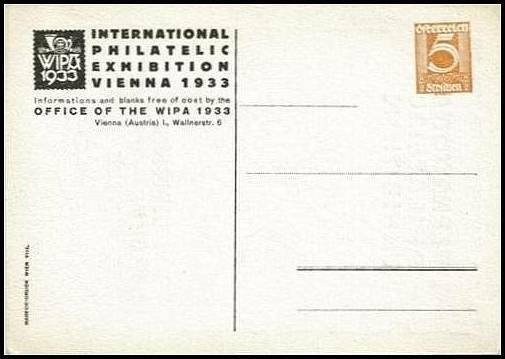 This may have been the first time any had been created for a philatelic event. 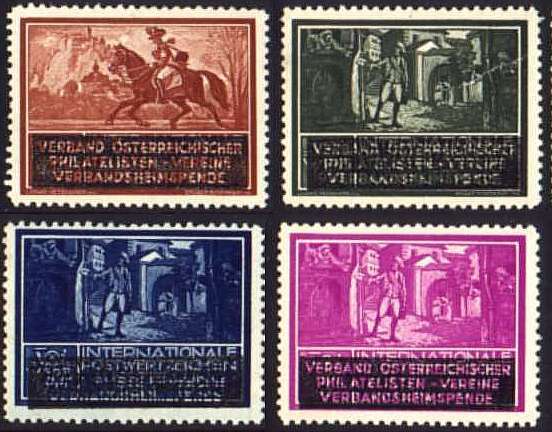 These labels are reprints of the first Austrian newspaper stamps, issued in 1851. 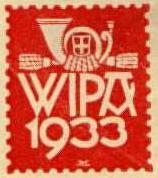 The original dies were used to create new dies with "WIPA 1933" in place of "K.K. 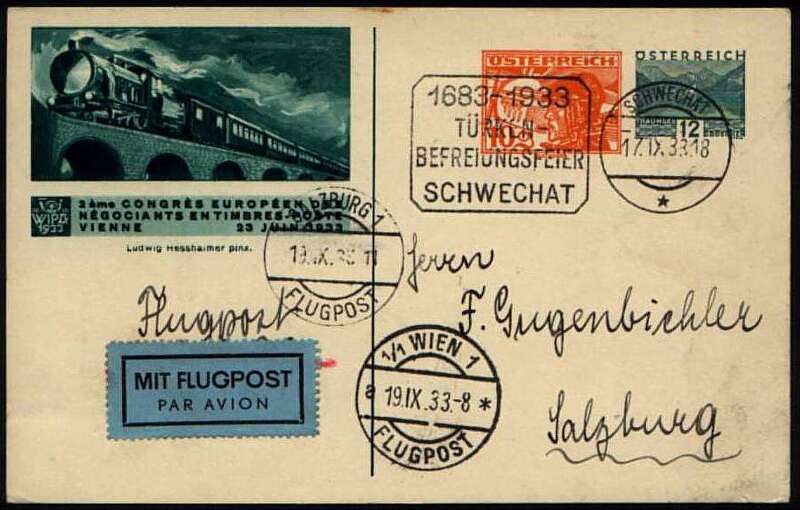 Zeitungs Post Stampel", from which plates of 16 entries were produced. The plates were used on presses installed at the show to print these sheets for distribution to attendees. 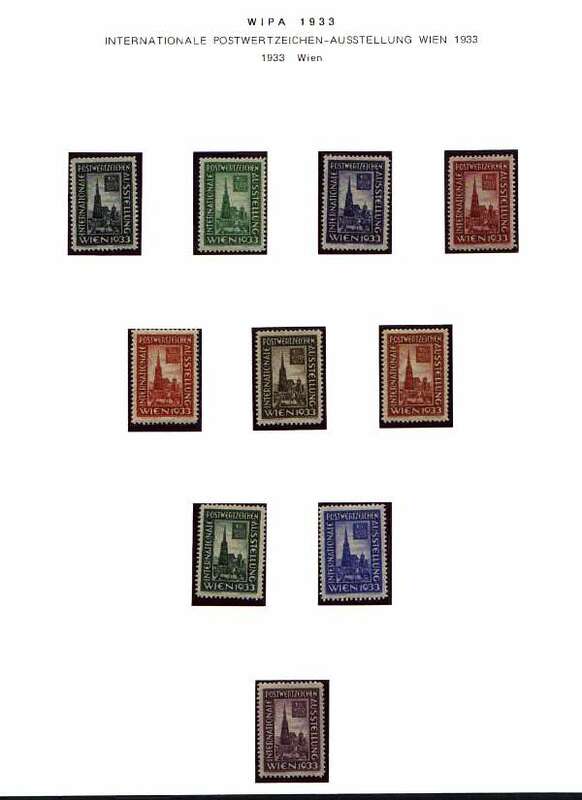 Nine different colors were used, all of which are shown above. 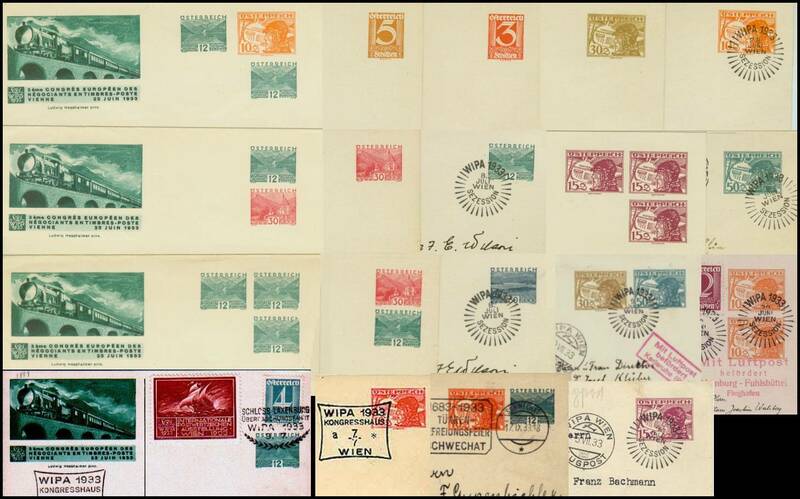 These labels are the WIPA 1933 items I know least about. 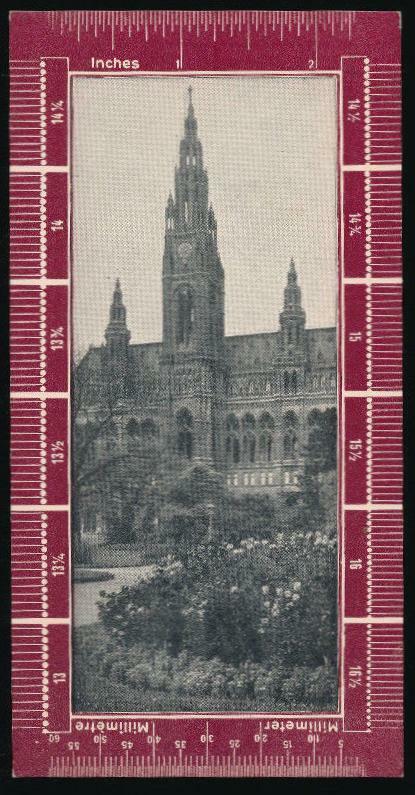 The building depicted is St. Stephens Cathedral in Vienna (Stephansdom). The three images above show a complete collection, ten colors in three languages - German, French, and English. 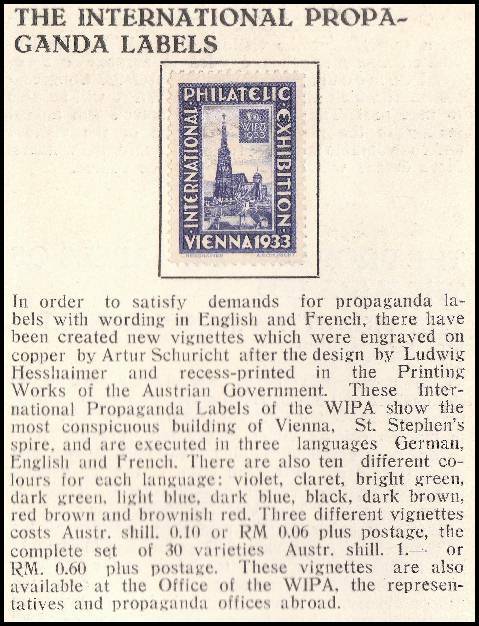 According to this excerpt from the 3rd Prospectus of December, 1932 they were created "to satisfy demand for propaganda labels with wording in English and French," and were available prior to the show. 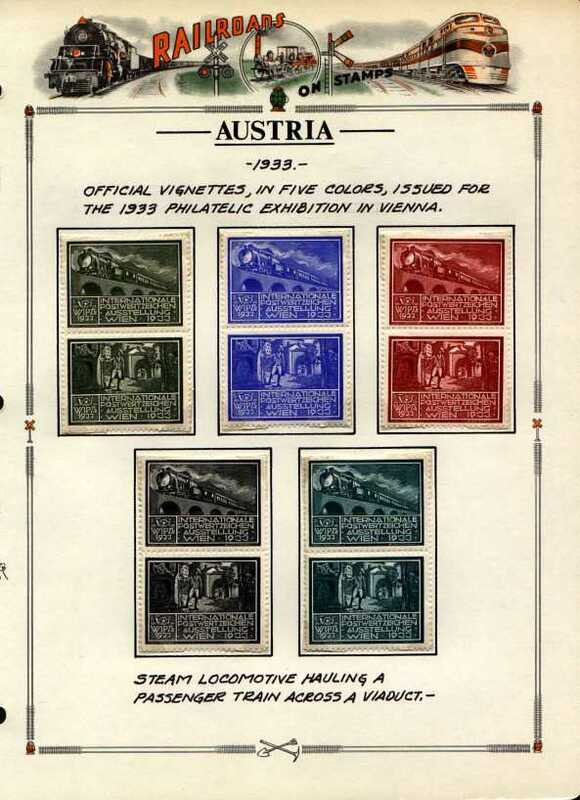 Their design was by Ludwig Hesshaimer, who designed the transport labels as well. They were engraved by A. Schuricht (about whom I have been unable to learn anything), and printed by the Austrian Government Printing Works. October 16, 2006 - Peter Sanders, a collector from Schijndel, Netherlands, sent the scan below, of a large multiple of the Stephansdom labels, demonstrating that all three languages were printed on the same sheet! 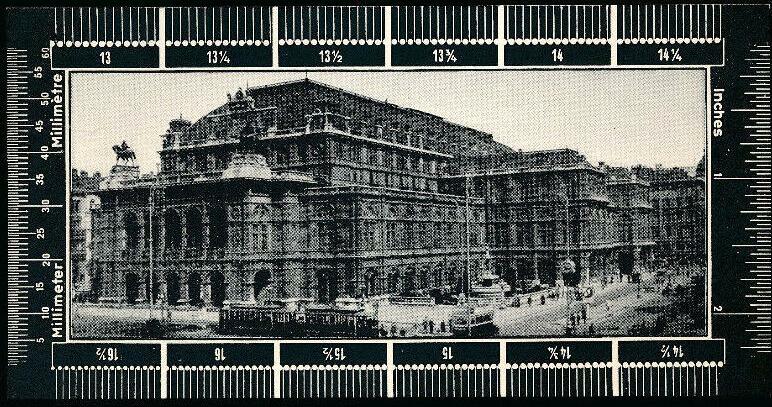 Since there is no selvedge, it is impossible to say from this example what a full sheet looked like, but my guess is that is was 12 wide by ten high, so what we see here is a half sheet. 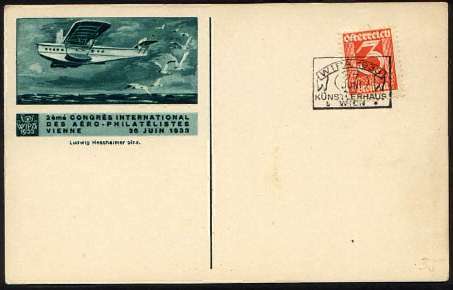 And here's an image I found on eBay, of a set of singles (English text) with the envelope apparently used to distribute them. 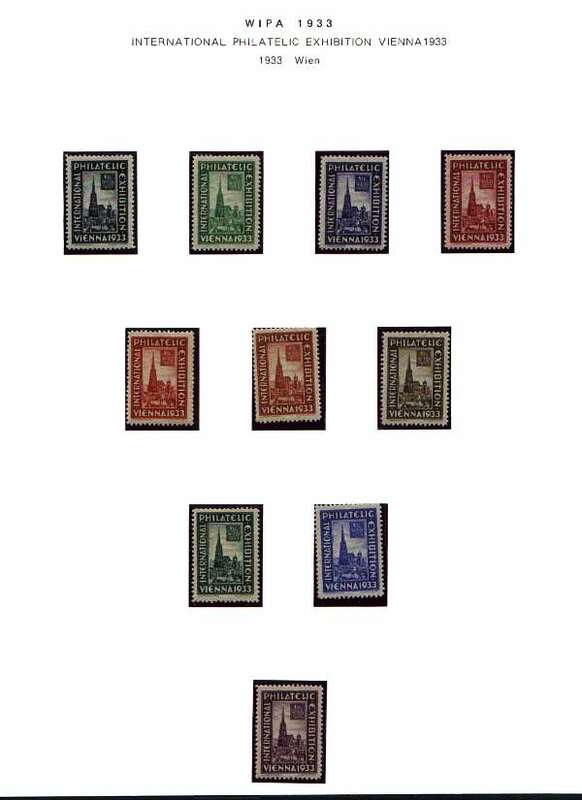 which advertises the cards above, and reveals that they were available either plain, or with preprinted indicium of 3, 5, or 12 gr. 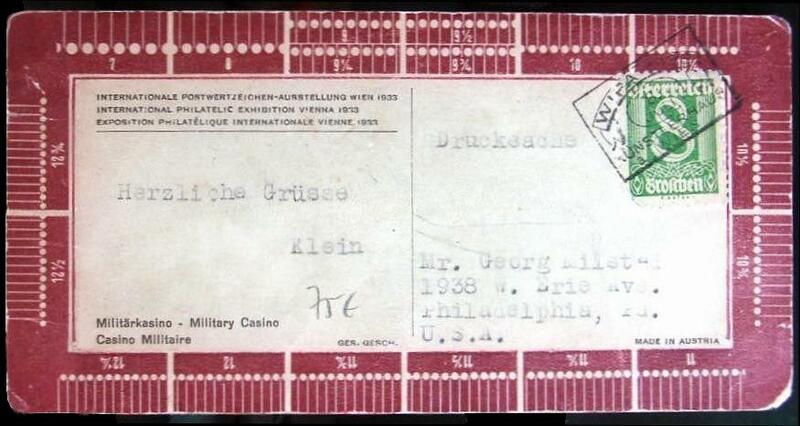 Also from eBay, a ticket booklet. 1/25/19 - Also from eBay, three perforation gauges!